The Austrian VBAG repays a third of the state aid granted in 2009. 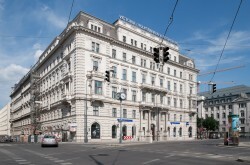 VBAG redeems a guaranteed bond to the Austrian state. The bond had its due date on Februar 9 2012. In total, the Austrian state received € 29.1m as guarantee provision. Interest was not paid, as VBAG did not record profits. In 2009, VBAG issued three bonds with a volume of € 1.0bn each. The two other bonds have their maturity in September 2012 and February 2013. This article includes a total of 63 words.